She was a Jew. Nothing could ever change that. 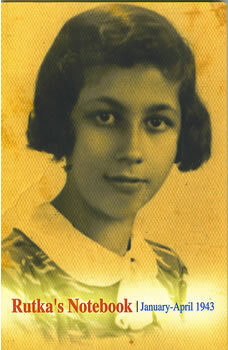 In many ways Rutka Laskier was a typical secular fourteen year-old girl. She had many of the fancies of a young adolescent first entering the adult world. For four months she confided her inner thoughts in a diary. But, something was very different about Rutka. She lived in Poland, 1943, under Nazi occupation. Soon after her last entry in the diary, she was deported and murdered in a Nazi gas chamber. Now, after more than sixty years, Rutka's diary has been published in English and Hebrew. It gives heartbreaking insight into daily life under Nazi tyranny. There is no shortage of books that detail the edicts and acts of the Nazis, but most are post-facto accounts, sometimes written by survivors, but most often compiled by researchers. These volumes list the brutal acts committed, but they are either interspersed with notes of hate and revenge, or they are dry academic treatises written to try to explain the unfathomable. Rutka's Notebook is different. It contains the human feelings of a young girl. Although the diary starts in January 1943, bitter experiences cannot be erased. Rutka shows clear signs of psychological trauma as she remembers the Aktion of the previous August. People were summoned to the local stadium, and then tormented by heat and rain. Finally, they were placed in groups according to their ability to work. Rutka watched as a German soldier ruthlessly murdered a little baby. There was no reason other than the fact that he was a Jew. This was a memory that Rutka carried with her for the rest of her life. Unfortunately, that life would end only all too soon. Rutka was not an observant Jew, but her experiences were only too explicit. She had no doubts. She was a Jew. Nothing could ever change that. Too often we concentrate on the physical torture inflicted by the Germans and their followers. Rutka highlights the psychological torment. Had she survived the Holocaust, she would most likely have had psychological scars for many years to come. Today, psychological referral is in vogue; during the 1940s one spoke of a soldier's battle fatigue, as those he were the only victim. How does one contend with death? The diary is clear. Rutka understood very well that her end was near. She knew that she was living in the shadow of death. Even in a ghetto the Jews knew of Auschwitz and of the fate of Jews deported there. The ghetto was not totally isolated. News from the Eastern Front filtered in. The Nazis were in slow retreat. There was hope, even false hope. If the Russians would only advance faster! This book does not provide inspiration. It provides no guidelines to make our lives better. Yet, it does evoke understanding of a chapter in history. Rutka wavers between some attempt at normalcy and depression brought on by knowing that a cruel end soon awaits her. Rutka's days are often boring and without content as she contemplates deportation and death. There are times of love and romance, "I met a handsome boy." There are times of gloom and contemplation, "You have to sit in this stinking and suffocating room and sew." The diary is a record the inner reflections of a young teenager, "I am sick and tired of these gray houses, of the gloom and fear seen in everybody's faces." These are citations from the same day, as Rutka wavered from thought to thought. How accurate this is, as all of us fluctuate between positive and negative thoughts, hopefully trying to stress the good. But, can one cope with the slow disappearance (and murder) of friends, always knowing that your turn will come shortly? The book, one of the very few diaries written under Nazi rule, does present a very real and touching description of daily life in a ghetto. The thoughts in the diary do not have the depth of Anne Frank. The diary is also relatively short. Yet, it provides a worthwhile glimpse of daily life under tyranny. After Rutka's testimony there are pages with pictures of life before the war. There were good times in Poland. People enjoyed life. That was Rutka's dream --- Poland of once --- but she did not live to see it. Is this book recommended? Absolutely yes, although the price might be a little bit high considering the length.